Has capability to Convert Outlook data items as like- calendars, emails, attachments, sent items, contacts etc. Convert Complete Outlook PST data as like- Calendars, Contacts and Emails etc. Convert PST file emails into names.nsf file or NSF file with attachments. 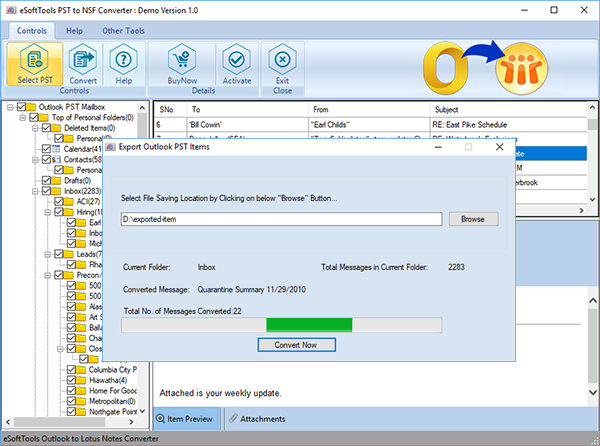 PST to NSF Converter allow users to convert emails from PST files into outlook file with maintains all data integrity. You can also export PST emails, contacts, calendars, task, notes and appointments folders into NSF file without difficulty. 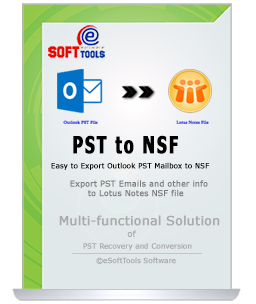 PST to NSF Software provides the option to export only selective folders or emails from outlook files and restore all of them into NSF file. For selective conversion, you can check or un-check emails or folders from outlook mailboxes that required to convert. For conversion, you don’t need to install Outlook on your machine because our software doesn’t requirement of outlook environment. You can download and install this PST to NSF Converter software and start the process for Conversion. PST to NSF Converter Software is safe application that maintains original folder structure of outlook profile during conversion outlook file to NSF file. It also maintains the entire email meta properties of emails and other contents of attachments. PST to NSF Conversion Software allows create single and separate NSF file during conversion time. You can save all contacts folders of outlook file into. nsf file and save emails of outlook files to lotus notes NSF file without creating problem. PST to NSF Software quickly scans all PST file items and preview conversion process of outlook file such as- emails, contacts, calendars, task, notes and appointments. It helps in recovery of outlook mailboxes folders and restore them into NSF File. Demo Limitation - The Demo Version demonstrate you complete working process and facilitates to export 15 emails. Select Individual PST files from multiple locations. Can I convert password protected outlook PST file into lotus notes NSF file using the software? Yes, this PST to NSF Converter Software supports password protected PST file for conversion so without problem you can browse your protected pst file to convert its complete data into NSF file. What is the size limitation for PST file to convert data into NSF by the software? No, the software doesn’t impose any size limitation of PST file, you can convert any size of outlook PST file into NSF file format. I want to convert only few folders of UNICODE PST file into NSF file can I do this? Yes, you the software gives the facility to convert selective folders or emails from outlook file and capable to support both ANSI and UNICODE PST file to convert data with maintains data integrity. Once I purchase the PST to NSF Converter Software then how will get software updates? Don’t need to be worried, you just need to visit website and check for regular updates. However, in case you want to update version then you can also send an email to our sales department that gives you with an updated version. We give free updated version of license from date of purchase. Can I open the converted NSF file created by the software in Lotus Notes version 9.0? Yes, you can open converted NSF file in lotus notes versions 9.0, 8.5, 7.0, 6.5 etc.